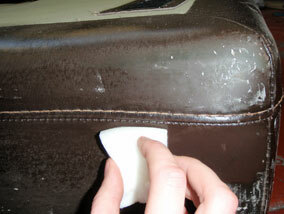 The advantages are, it is very easy to do, quick, cheap and will greatly improve the look of the sofa. 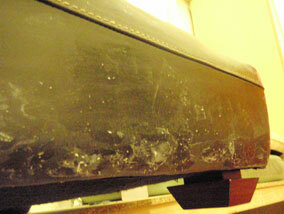 The disadvantages are, the scratches must be a lighter shade than the rest of the sofa for it to work. 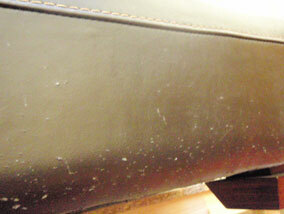 This photo shows cat scratches on the seating cushion. 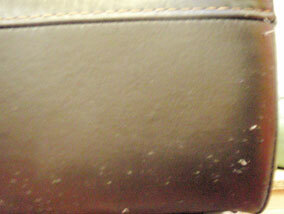 You can see that the scratches have only cut into the leathers coating and not the leather itself. If your damage looks like this, then you'll need to read the scratch repair guide to get the correct technique to repair the scratches. If the damage looks like the photo to the left, then read the instructions below on how to fix it. 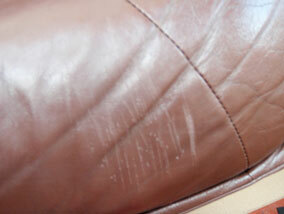 This type of cat damage is caused by the cat sticking it's claws into the leather. 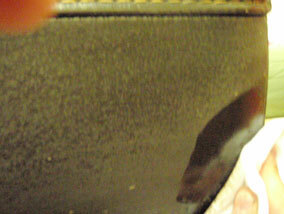 Then, when the cat pulls it's claws out, it draws the fibres of the leather out with them. 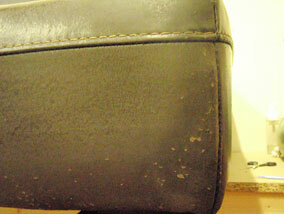 This causes the leather to become rough and unsightly. 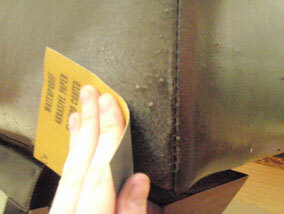 It only happens like this on the sides of the sofa, as manufacturers use a different type of leather (split) on the sides. The first step is to use the scissors to trim down the loose fibres. 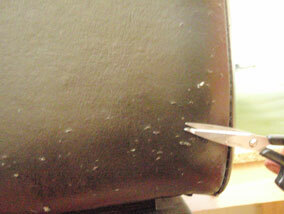 Then using the scalpal, cut out any bits of leather that are raised. Doing this is basically trimming the leather down to make it cleaner and neater for the following stages. 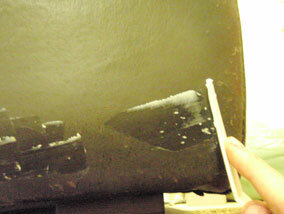 Then after doing that sand the leather down using 320p sandpaper to further remove any rough bits of leather. Then, sand the leather down with 1200p sandpaper to smooth it over. This process will this down the painted coating on the leather making the scratches less noticeable. 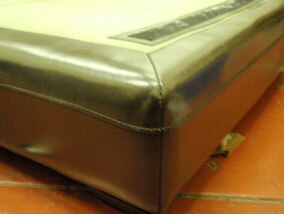 These photo's simply show what the leather will look like once it has been trimmed and sanded down. The next step is to wipe the leather down with the alcohol cleaner to remove and dirt and grime from the leathers surface. This ensures proper adhesion of colour when we come to apply it in later stages. Leave the leather for 10 minutes for the alcohol cleaner to evapourate off. Then, using the heavy filler and pallette knife, spread the filler over the scratches. Leave for 5 minutes to dry then sand down with 1200p sandpaper. This fills the cat scratches in and makes for a smooth repair. 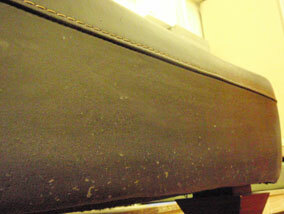 This photo shows the heavy filler that has been applied to the side of the sofa. After it is sanded the leather colourant will be applied. Sometimes after applying the colourant, it emphasises some of the scratches you though were 'healed'. Simply apply more filler, sand down and re-apply the colour. Start off by aplying the first coat of colour by sponge. As you can see by the photo, the colour is covering very well, so I won't bother spraying it on. I'll apply a second coat of colour by sponge instead. Once you have a good coverage of colour, either by sponge or airbrush, the next step is to spray a lacquer onto the leather to seal the colour in. This leather was very shiny so I have applied a gloss finish to it, to enhance the shine.